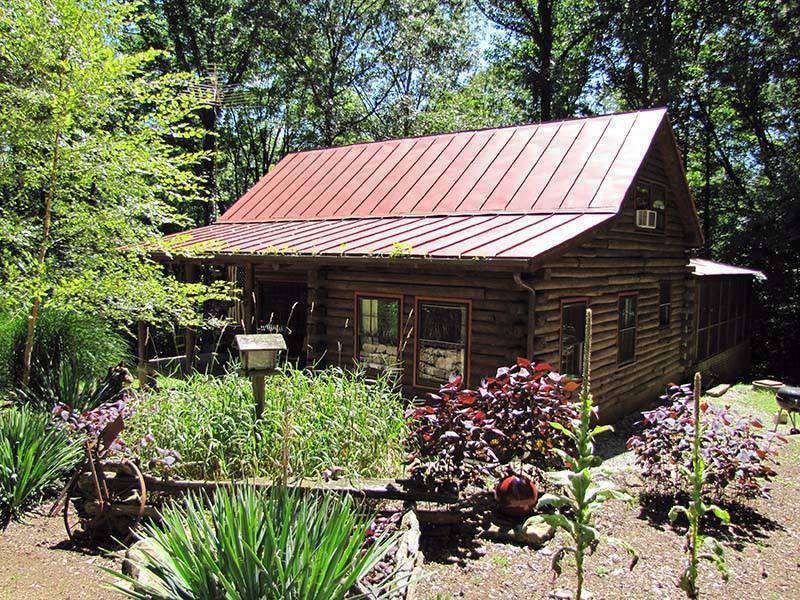 A real log cabin tucked away at the end of a Brown County lane….. nestled in a piney woods…. secluded, yet only minutes from the Village of Nashville. Come experience this unique get-away in the “Hills of Brown County” – you won’t want to leave. The Cabin in the Pines has a large open great room, dining room, and fully equipped kitchen downstairs, all accented with a cozy hearthstone gas-log stove. Upstairs are two separate loft bedrooms, each with a full-sized fancy scrolled iron bed – made up with fresh linens, plenty of pillows and colorful quilts. A third bedroom is downstairs on the main level. On warm, balmy evenings rock on the old front porch swing and listen to the spring peepers and owls as they tune up for their nightly concert. Or take your meals out on the huge screened-in back porch – complete with a working hammock. The Cabin in the Pines is the perfect get-away for two to six people – with plenty of room to relax, cook in or out, and see first-hand what is so satisfying about living in a real log cabin in the Hills of Brown County. If you want to experience something uniquely different and truly “get-away” and experience something uniquely different and satisfying, please contact us for reservations. Extreme peace and quiet. We wanted a quiet weekend to escape the hustle and bustle. The quiet evenings on the porch we heard only the peaceful sounds of nature. The drive to Brown County Star Park was quick and the Park was outstanding. It’s the first time I came back from a mini vacation relaxed instead of worn out. Cabin in the Pines is a tranquil oasis. We definitely enjoyed the simple pleasure of relaxing on the porch or walking around the yard. The environment was so pleasant after the chaos of IU campus during graduation! Thank you so much for this wonderful cabin. We will definitely be staying here again. We come here every year and without a doubt we will be staying here from now on! Thanks again!